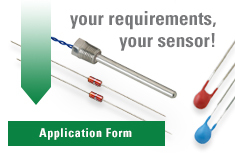 Littelfuse low cost glass encapsulated thermistors are manufactured using super stable chips which are hermetically sealed in a glass (DO-35 diode style) package. The result is a device which exhibits excellent long term reliability and stability even when subjected to severe environmental or thermal conditions. Their uniform dimensions and axial lead configuration make them especially suitable for use with automatic insertion equipment.